Of Indigenous Australian and Vanuatuan descent, Santo was born in Townsville, Queensland and grew up in Charters Towers. He played his junior rugby league for the Charters Towers Miners (and later Townsville Brothers) and attended Blackheath and Thornburgh College. While at Blackheath and Thornburgh, Santo was a Queensland Reds scholarship holder. In 2011, Santo joined the North Queensland Cowboys NYC squad on a trial and train contract and represented the Queensland Under 18s team. 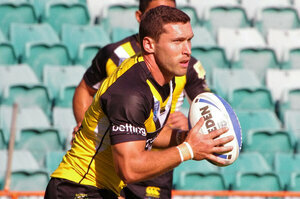 That year he played in the Cowboys' 2011 NYC Grand Final loss to New Zealand Warriors. At the end of 2012, Santo won the Cowboys' NYC Player of the Year award. In 2013, Santo played for the Queensland Under 20s team. He finished his NYC career at the end of 2013 with 65 games, scoring 49 tries. On 5 August 2013, Santo re-signed with the Cowboys on a 2-year contract and joined the Cowboys first grade squad in 2014. Santo started the 2014 season playing for the Cowboys' Queensland Cup team, the Mackay Cutters. In Round 17 of the 2014 NRL season, Santo made his NRL debut for the Cowboys against the St. George Illawarra Dragons. Santo spent the 2015 season playing for Cowboys' feeder club the Townsville Blackhawks in the Queensland Cup. At the end of the 2015 season he was released by the Cowboys. 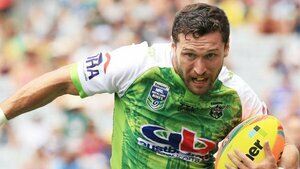 In December, Santo signed a 1-year contract with the Canberra Raiders starting in 2016. In September, Santo was named at fullback in the 2016 Intrust Super Premiership NSW Team of the Year. Santo was named in the Canberra Raiders squad for the 2017 NRL Auckland Nines. On the 25th of May Santo was immediately released on his final year of his Canberra Raiders contract, and signed on a one year deal with the New Zealand Warriors.